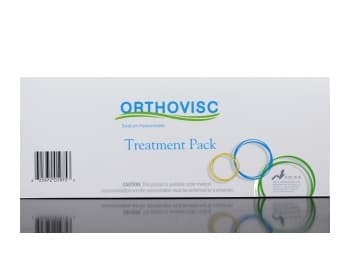 How And Where To Buy Orthovisc Online? You can buy Orthovisc online through our Canadian International Pharmacy at huge savings. We offer RX and OTC medications online with a valid prescription from your doctor. At Canadian Pharmacy World, your health is our priority. You can place the order online, by mail, by fax or toll-free over the telephone at 1866-485-7979. Are There Alternative Names For The Brand And Generic Orthovisc? Orthovisc is available from Canada and Turkey by Anika Therapeutics. There is no generic form of Orthovisc available yet. What Dosages And Forms Is Orthovisc Available In? Each mL of Orthovisc contains 15 mg of sodium hyaluronate. It is available in a disposable glass syringe delivering 2mL of sodium hyaluronate dissolved in physiological saline. What Is Orthovisc Used For? The medication Orthovisc is a sterile and non-pyrogenic solution of hyaluronan contained in a single-use syringe. Hyaluronan is a natural complex sugar of the glycosaminoglycan family. The hyaluronan is extracted from rooster combs. This medication is indicated for the treatment of pain in osteoarthritis (OA) of the knee in patients who have failed to respond adequately to conservative non-pharmacological therapy or simple painkillers such as acetaminophen. What Are The Possible Side Effects Of Orthovisc? These are not all the possible side effects of Orthovisc. In case of any other unexpected effect, contact your healthcare professional immediately. Are there any Precautions and Drug interactions for Orthovisc? Avoid jogging, strenuous activity, or high impact sports such as tennis for at least 48 hours after your injection. Also, avoid weight-bearing and standing for longer than 1 hour at a time. Do not concomitantly use disinfectants containing quaternary ammonium salts for skin preparation as hyaluronic acid can precipitate in their presence. The safety and effectiveness of the use of Orthovisc in joints other than the knee have not been established. The effectiveness of a single treatment cycle of fewer than 3 injections has not been established. Pain relief may not be seen until after the third injection. The safety and effectiveness have not been established for more than one course of treatment. Only medical professionals trained in accepted injection techniques for delivering agents into the knee joint should inject Orthovisc for the indicated use. •	Are breastfeeding, it is not known whether hyaluronan passes into breast milk or if it could harm your nursing baby. Tell your doctor if you are breast-feeding a baby. Orthovisc should be stored at a temperature between 2-25°C, protected from freezing, stored in its original packing. Store the tablets in the original bottle to protect them from light and moisture. Keep the medication out of sight and reach of children.